Obstructive Sleep Apnea (OSA) is a condition that occurs when your airway becomes blocked during sleep, usually by your own tongue. Apnea is defined as “a cessation of airflow for at least 10 seconds.” OSA can occur frequently throughout the night, and you might not even know it. Obesity and OSA can form a vicious cycle. Being obese doesn’t guarantee you’ll suffer from OSA, but it is a common contributing factor. In turn, your body responds to the lack of oxygen by producing enzymes that make you hungry, possibly leading you to eat more and put on extra weight, thus making OSA worse. Dr. Barwick can provide you with options to manage your OSA. First, you’ll consult with Dr. Barwick. After talking with Dr. Barwick about your sleep habits and history, you may decide to undergo a home sleep study. Our office will provide you with a Home Sleep Test, which is a small device that you wear while you sleep in the comfort of your own home. This device will measure your snoring, your oxygen saturation, your sleep levels and your pulse. If you decide with Dr. Barwick that you have sleep disordered breathing, you may will most likely undergo a polysomnography (PSG), which is a more comprehensive sleep study conducted in the a hospital or sleep lab. The PSG measures more than a dozen different factors that may be affecting your occur during your sleep. This type of sleep study is usually covered by your medical insurance. Many people are familiar with the Continuous Positive Applied Pressure, or CPAP, appliance used to ease symptoms of OSA. The CPAP can be either a mask or a nasal canula that gently forces air into your airway to keep it from closing while you sleep. 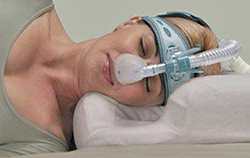 The CPAP is considered to be the “Gold Standard” in managing Oral Sleep Apnea. Many patients have had very positive results using the CPAP appliance. However, the majority of patients have difficulty wearing the device while they are sleeping. If you find that you have been diagnosed with sleep apnea by a physician, you may be a candidate for oral appliance therapy. This means that you can wear a small appliance (think back to your old retainers after your braces) to help resolve your symptoms. The appliance, called a Mandibular Advancement Device (MAD), will push move your jaw forward slightly to help keep your tongue from blocking your airway. Dr. Barwick can help you choose an oral appliance that is right for your condition, and follow up on adjusting the device to manage your sleep apnea. 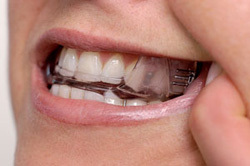 Fortunately, Oral Appliance Therapy is frequently covered by most medical insurance plans. Dr. Barwick wants to help you improve your sleep and your quality of life! Contact our office for a free consultation and evaluation. Call (978) 957-5511 today to find out more about OSA and to explore the ways that Dr. Barwick can help reduce your symptoms.